This BioProvince (as defined by Armen Takhtajan) comprises the southeastern coast of Brazil and its associated islands including the archipelago of Fernando de Noronha. The area is largely characterised by evergreen tropical rain forest known as Atlantic Forest or Mata Atlântica, which stretches along Brazil's Atlantic coast from the northern state of Rio Grande do Norte south to Rio Grande do Sul and also extends inland to eastern Paraguay and into the province of Misiones in northeastern Argentina. There is also a narrow zone along the coast into Uruguay. The geology is complex and varied but much of this BioProvince stands on a Precambrian crystalline shield. The area straddles tropical and subtropical climates but is also heavily influenced by the humid air masses from the Atlantic Ocean. These condense to form mist or rain and are responsible for the humid character of the area. Overall Atlantic forests extend as far as 500-600 km inland and to altitudes of up to 2000 m. Long isolation from other major rainforest blocks in South America these forests have an extremely diverse and unique mix of vegetation and forest types and support some 20,000-plant species, 40% of which are endemic. Not surprisingly there is now major international concern that less than 10% of these forest remains. In addition to forest this BioProvince includes some extremely interesting and distinct upland vegetation sometimes referred to as Brazilian Páramos because of its similarities to Andean Páramos. This is mostly found on the upland ‘plateau’ of Serra do Itatiaia (part of the Serra do Mantiqueira), Serra do Caparaó and Serra dos Órgãos (part of the Serra do Mar). One of the most famous outcrops is Suger Loaf Mountain (Pão de Acucar) in Rio de Janeira, which is part of the Serra do Mar. In Serra do Itatiaia 11% of the flora is represented by narrow endemics and a further 21% is confined to the Campos do altitude (high altitude grasslands). The latter also includes a number of endemic genera such as Glaziophyton (Poaceae: Bambuseae), Itatiaia (Melastomataceae), Magdalenaea, Nothochilus (Scrophulariaceae) and Worsleya (Amaryllidaceae). The high levels of endemism on these uplands is no doubt linked to extended period of isolation but another possible causal factor on the Itatiaia plateau is the high levels of aluminium found in the rocks and soil. Depending on altitude at least four major vegetation types have been identified: the lowland forest of the coastal plain and interior, montane forests, and the high-altitude grassland or campo rupestre, and rupicolous vegetation. 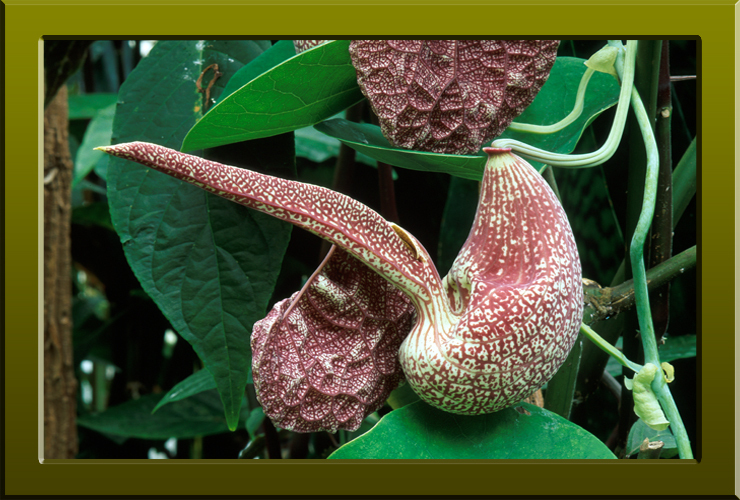 Aristolochia labiata (Aristolochiaceae) a stange looking plant native to the Atlantic forests of Brazil (Copyright © 2010 Peter Martin Rhind).